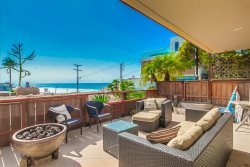 Code: D-Fantastic Beach Condo in Solana Beach! Ocean-Front Complex, Bright & Relaxing Condo, New Furnishings, Heated Lap Pool, Tennis, Spas, Suana, Steps to the Beach in Solana Beach & Tennis Club! Luxury Townhouse VIEWS VIEWS VIEWS!